I’ve always loved the look of vintage ornaments! The bright colors are so perfect and fun! 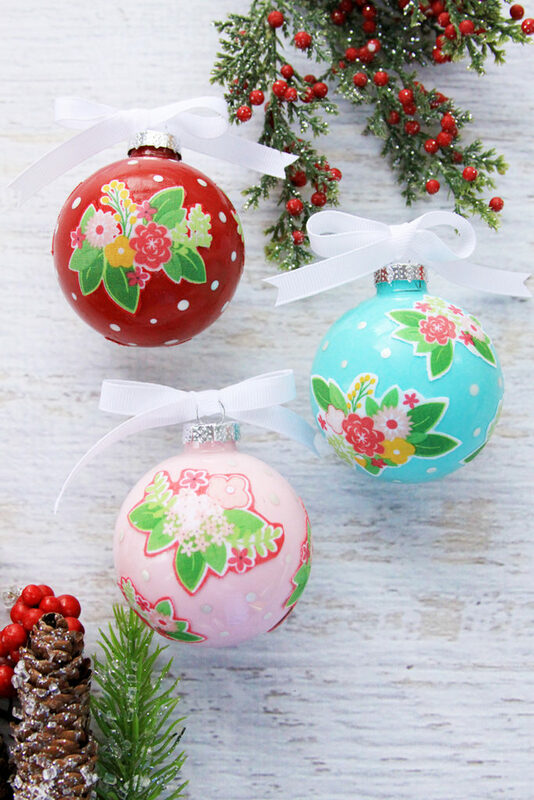 I just had to combine that with some of the florals from Vintage Adventure fabrics and I love how these sweet Colorful Floral DIY Ornaments turned out! 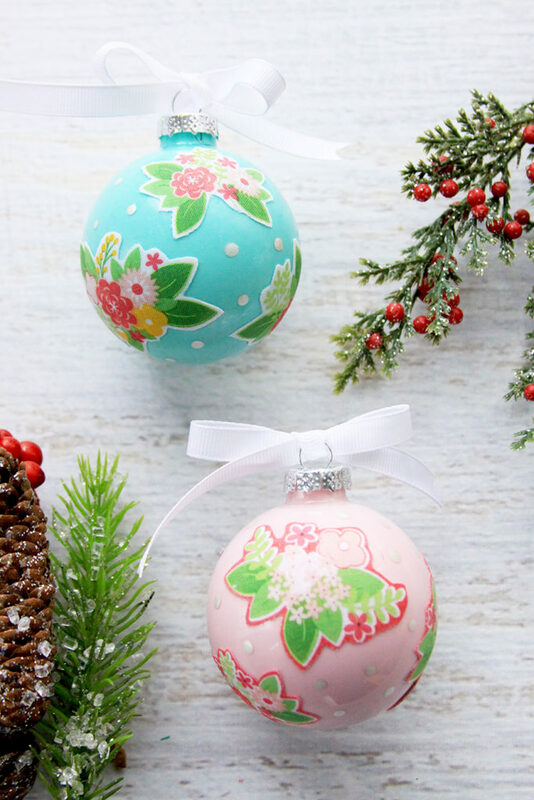 I love how they have the look of hand painted ornaments but they are so much easier to make! 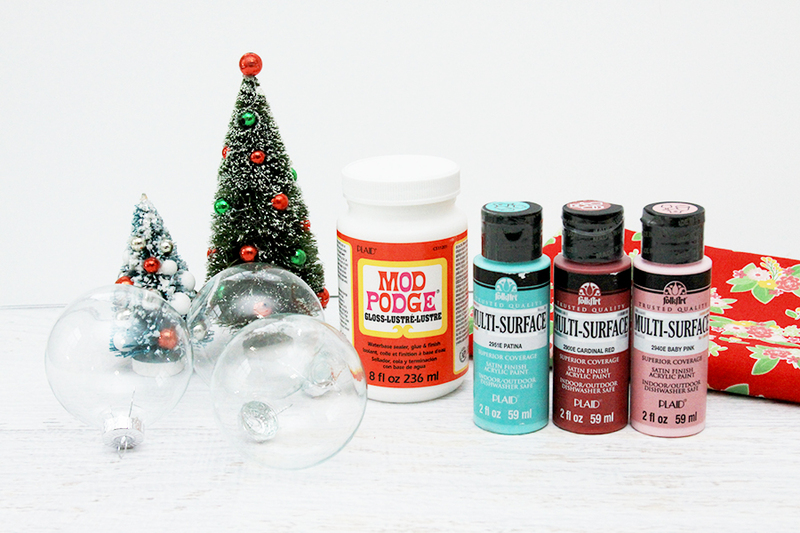 They are a combination of paint and Mod Podge and it’s so simple to make several at once. You can really customize them too by changing up the colors of paint you use inside. 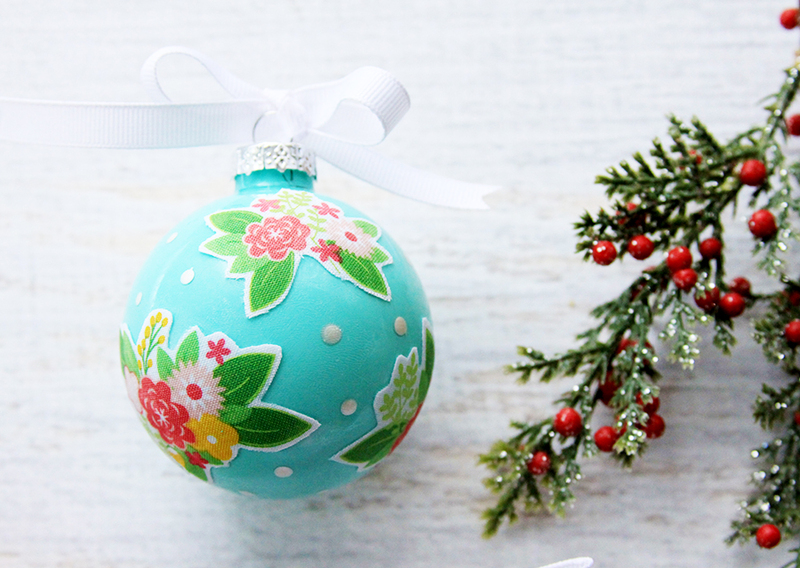 Begin by pouring the paint in the glass ornaments. You’ll need about a tablespoon. I recommend adding some, then swirling and shaking it around (with your thumb over the hole), then adding more paint as needed. If you add too much it adds to the drying time. 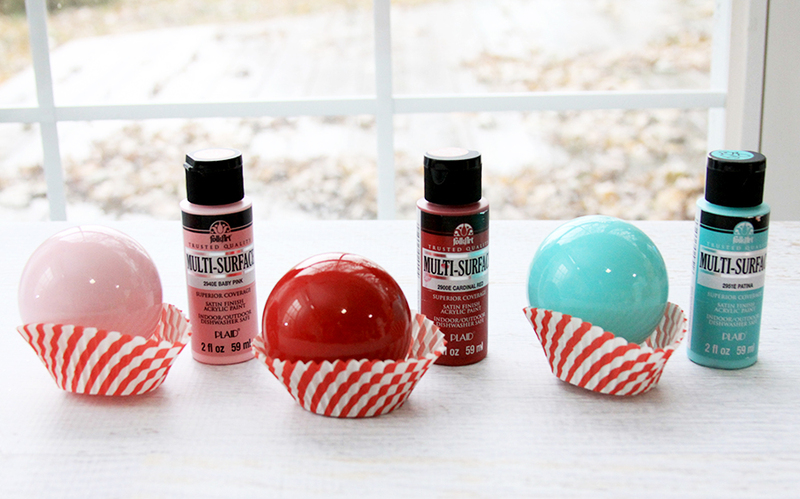 Place your ornaments in a cup or someplace they can dry upside down and let them dry overnight. 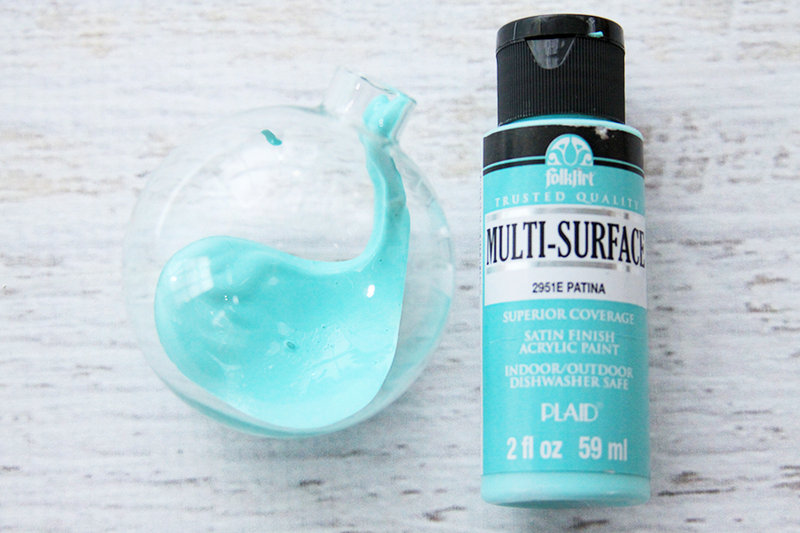 The Multi-Surface paint has such a great coverage that it’s easy to fill the ornaments and have a gorgeous bright color inside without worrying about light spaces. 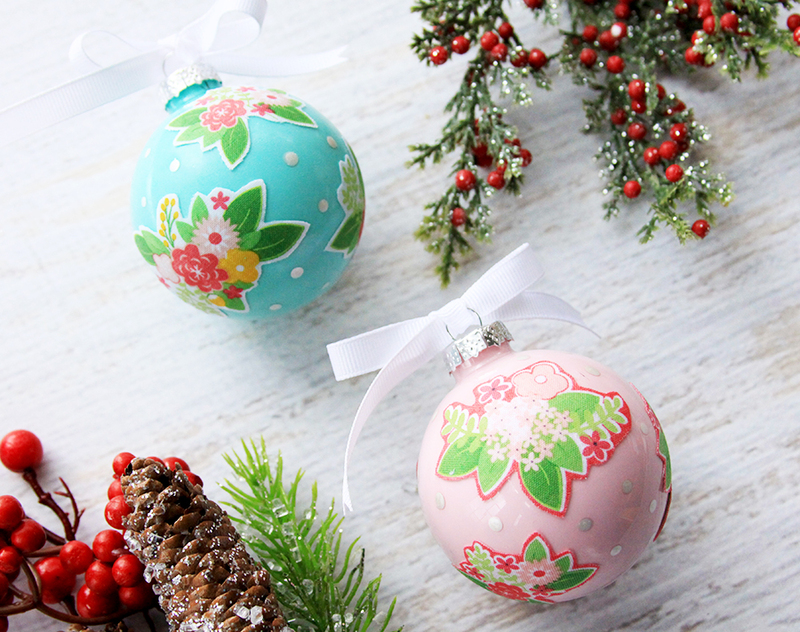 Cut out the fabric pieces you’re using on the ornaments. 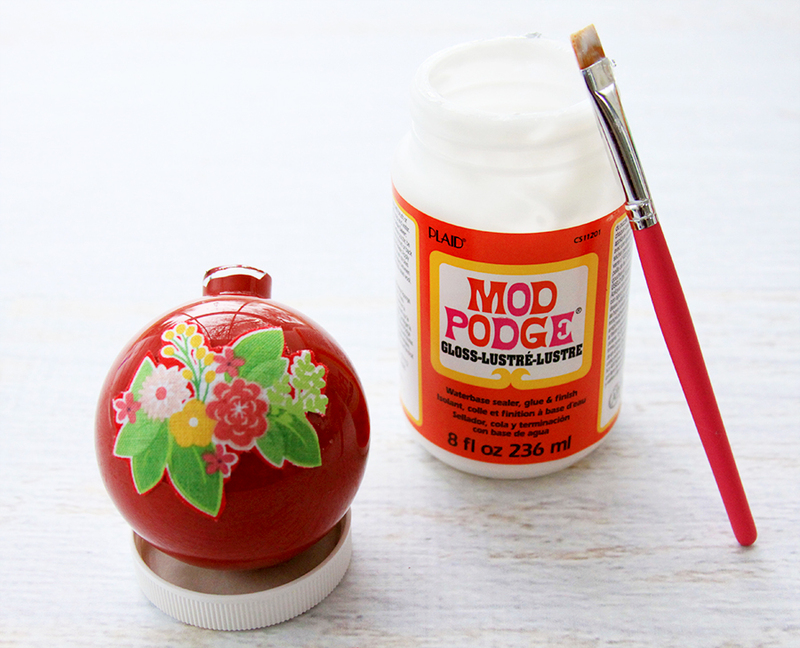 Apply a light coat of Mod Podge on the wrong side of the fabric and place the fabric on the ornament. Keep adding pieces of fabric until the ornament is as covered as you’d like. Brush a light coat of the glossy Mod Podge over the top of the fabric, overlapping just a bit onto the glass to seal the edges. 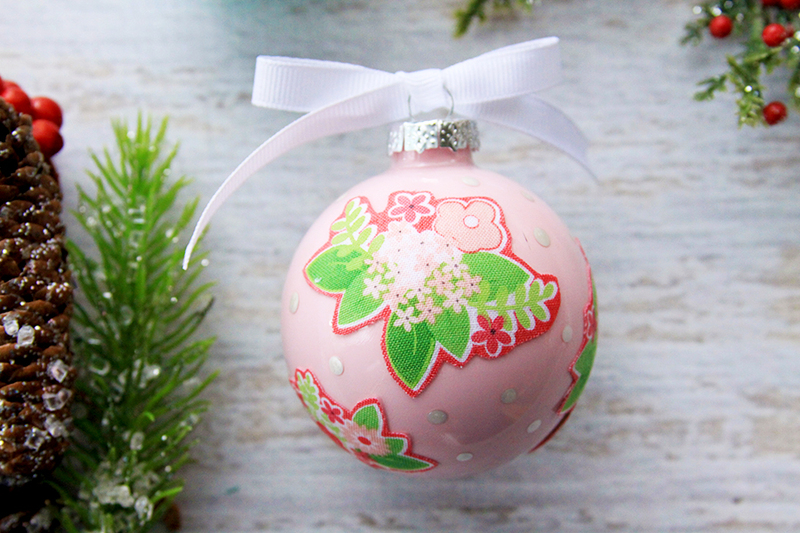 Once the fabric is dry enough to handle, use the end of a paintbrush to add little pearl polkadots in the spaces around the ornament where there isn’t fabric. Let the ornaments completely dry – I recommend 24 hours. Place the tops back in and if you’d like, finish them off with a little ribbon bow! 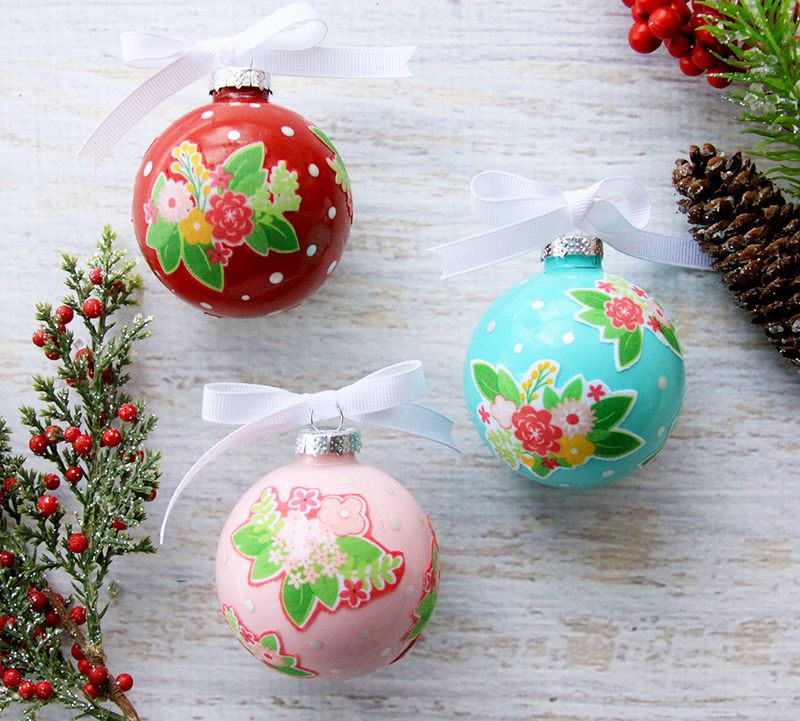 Now you can decorate your tree with some vintage inspired colorful floral diy ornaments! I LOVE your decorated balls. I made unbreakable balls when our babies came along. 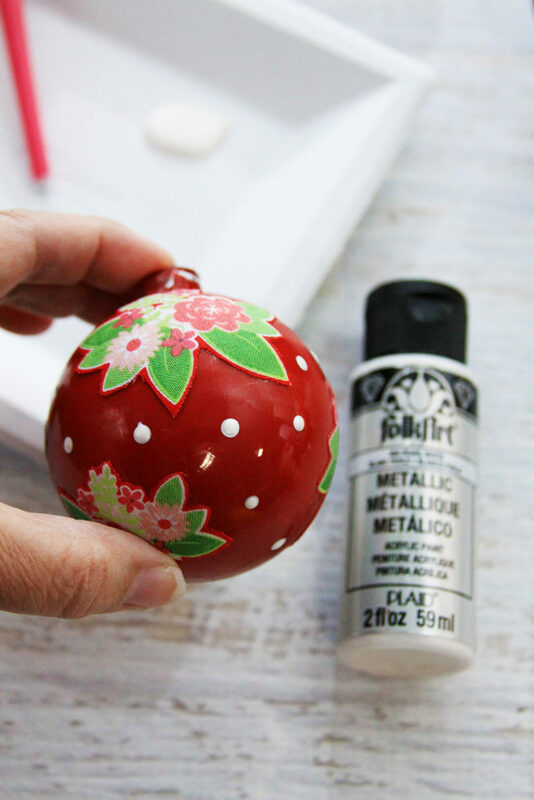 I used styrofoam balls decorated with pretty wrap paper and used the modgpod glue also. little hands might grab them off but not get cut from the glass balls. these were on the lower branches of the tree. my pretty ornaments were placed above the lower branches and it was beautiful! I’m not sure, on the plastic balls, I used glass ones, years ago, when I made them! It would be worth trying them! I’d go for it! There’s so many more options out there, now!! Hope you give it a try! Love love love these!!! Super idea! Thank you! These are adorable, Bev! I made some of these years ago! I certainly need to make more now, that I’ve seen them again! What goes around, always comes back around again!! Ha! Darling in your fabrics!! I love these. Can you tell me if I would get the same effect if I used plastic balls or will that change the look. I’m so in love with these ornaments. These are so beautiful! What a great idea! I love the colors and the florals. 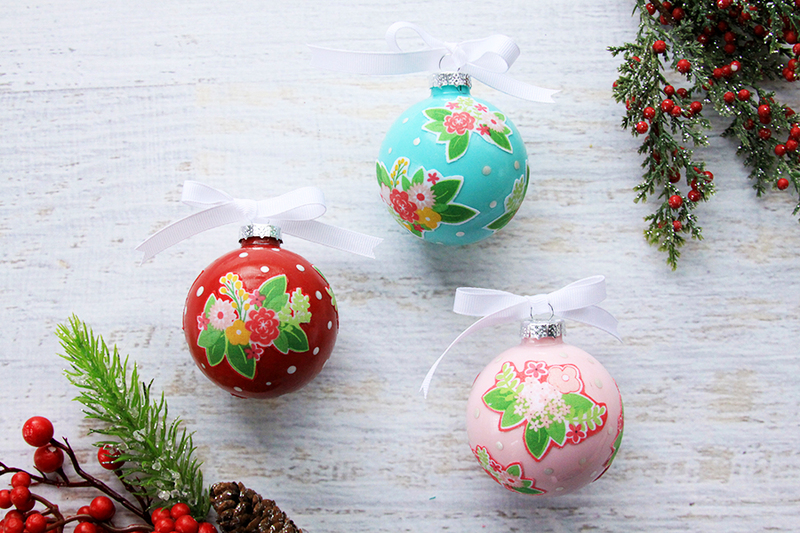 These ornaments will hang beautifully on any tree! Wow! 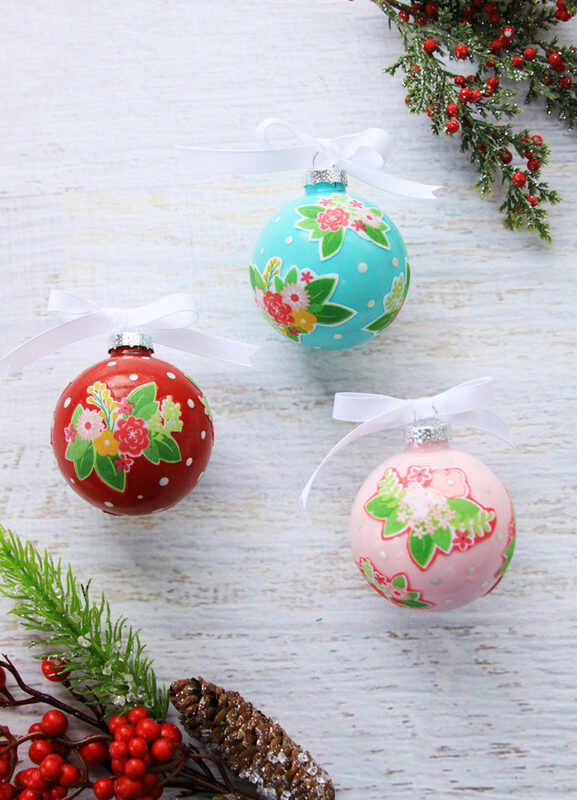 These ornaments are so beautiful! I especially love the blue ornament! Thanks for sharing at the Snickerdoodle Create Bake Make Party!